The International Association of Internet Broadcasters(IAIB) is the principal voluntary trade organization representing the interests of Internet broadcast professionals throughout the world. 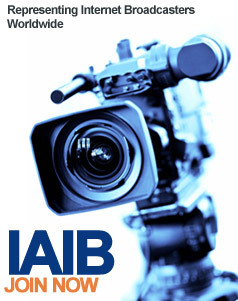 Considered the most prominent and effective voice of internet broadcasting, the IAIB was founded in direct response to the growing sentiment that this powerful broadcast medium was in need of appropriate representation. The International Association of Internet Broadcasters not only represents independent and corporate broadcasters, but welcomes equipment suppliers and providers of other services to the Internet Broadcasting Industry. * Promoting professional customs and practices in the best interests of Internet Broadcasters and to the public they serve. *Promoting the art and business of Internet Broadcasting. *Fostering fellowship and open communication among Internet Broadcast Professionals for the purposes of sharing their knowledge and advancing the field. The International Association Of Internet Broadcasters is the the foremost source of information, education and advocacy for the Internet Broadcasting Industry. Browse through various topics ranging from broadcasting equiptment discussion to online distribution. The online message forum enables you to connect with other likeminded individuals to learn and share information in this rapidly emerging broadcasting medium. Whether you’re looking to build your professional brand or simply gain widespread exposure for your broadcast, creating an IAIB membership profile allows industry insiders, advertisers and fans to learn more about what you do. There is a lot more to online broadcasting than just turning on the mic and hitting the record button. A great team of professionals can really help you get your broadcast where you want it to be. The IAIB industry providers have skills in many fields including graphic design, programming, web development, sound engineering and more.